➤SPECIAL 3-WAY CARRYING --- Convertible versatile bag! 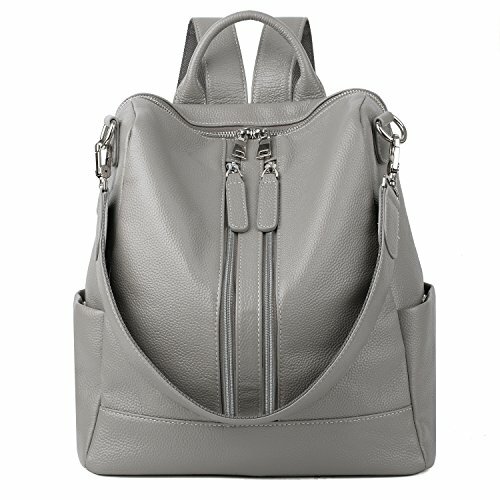 You can carry it as a handbag/single shoulder bag/backpack as there is a removable short shoulder strap (shoulder drop is 11"). ➤PREMIUM MATERIAL --- Cowhide Leather with silver color hardware; heavy duty zippers and brown fabric lining; adjustable canvas/leather strap to prevent slidding off your shoulder. Every stitching joints have been reinforced for durability. ➤WELL ORGANIZATION --- Exterior: 2 front zipper pockets, 1 back zipped pocekt, 2 side open pockets. Interior: 1 big compartment with 2 open pockets and 2 zipped pockets. ➤LARGE CAPACITY --- This backpack can accomodate your books, small makeups, notebook, wallet, umbrella and 13" thin laptop whose size is under 12.99"(length) x 9.1"(width), and so on. ➤DIMENSIONS --- 11.22"(bottom length) x 12.00"(height) x 5.12"(bottom width). Handle Strap: 1.97"(5cm)by9.84"(25cm), Shoulder Strap: 37.79"(96cm). The weight is 1kg.